Finishing this was a priority for me this week. I had a vision of what I wanted the quilting to look like. And let me tell you, that I did not fully realize that vision. I was going for a random crossed lines look, and it just looks… meh. I tried to use blue painter’s tape as a guide, but that didn’t last. The tape kept peeling off the quilt top and sticking to itself. As a result, my lines aren’t exactly straight. 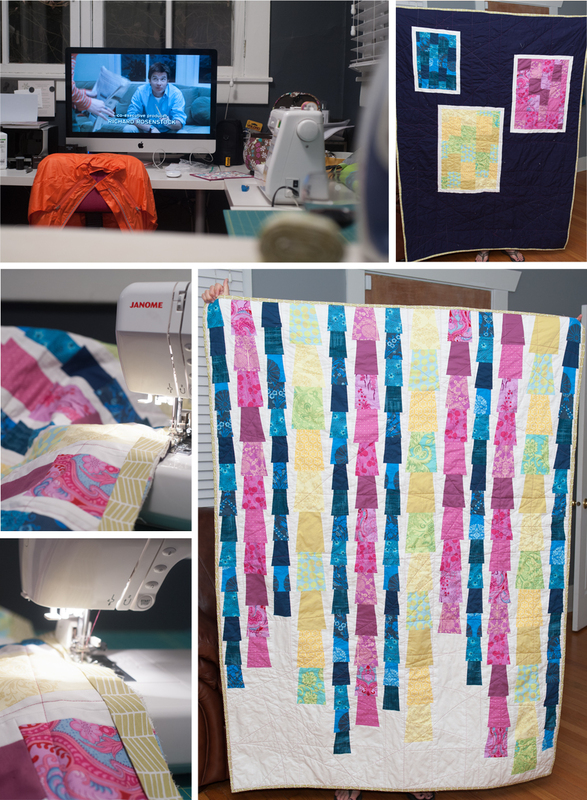 I pieced the binding and attached it to the quilt sandwich all while watching 4 episodes of Arrested Development Season 2. Love those Bluths! Quilting purists would be horrified at my binding method, and the messiness of it. But I’m not a purist. This is a quilt for me, and I like it. It’s beautiful and as long as you like it, that’s all that matters!